A number of Island artists were represented at the 2015 Annual Exhibition of the Royal Society of Marine Artists. Held at the Mall Galleries in London a total of 329 works were on show. 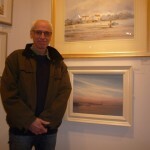 Martin Swan from Newport is a RSMA member and had six oil paintings in the Gallery. Racing in the 2010 Classic Boat Regatta in Thorness Bay was depicted in one scene, along with Last Light- Hurst Castle, Foredeck 1 and 2, ‘V’ and Red Funnel Mooring II. An RSMA officer with a responsibility for Education and demonstrations Martin gave oil painting demonstrations to school children one day as well as running a class for those wishing to emulate his style on another day. Melanie Swan, Martin’s wife, is a friend of the RSMA and her screenprint entitled Plankton 2 was also on display. 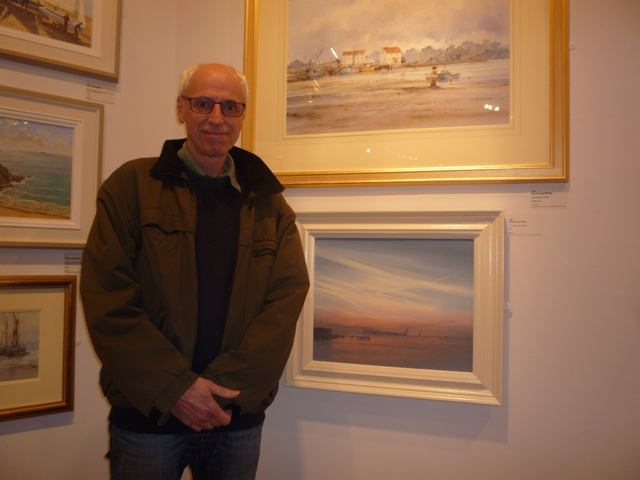 Bembridge resident Ivan Lapper, another RSMA member had five paintings in the exhibition. As well as a Venice Canal scene there were views of Mullion Harbour and Mevagissey Inner Harbour. Completing the trio of Island RSMA members Rowena Wright from Cowes had three pastels in the show. Two depicted Mariquita and Moonbeam of Fyfe. President of the RSMA 1974-1978, Keith Shackleton MBE, who died in April this year aged 92, was remembered at the exhibition by means of one of his works of art, a 1991 oil painting ‘Kayak off Cape Brewster’. Elected to membership in 1962 he was awarded life membership in 2007. Keith, who was the resident artist on the BBC’s ‘Animal Magic’ programme with Johnny Morris, was related to polar explorer Sir Ernest Shackleton and was the son of aircraft designer William S. Shackleton. Sheena Bevis-White’s study of the racing yacht ‘Juno’ in oils won the Classic Boat prize. An oil painting by Tony Williams ‘Ship with Moon’ won the Charles Pears award. Island marine scenes were well represented and included Velsheda off the Needles, Yarmouth Old Gaffers, Below the Needles Battery, sailing on the Solent and Bembridge Breakwater.